While many of you gazed at the total lunar eclipse on Jan. 20, you probably had no idea you were witnessing something unprecedented. Amateur astronomer Christian Fröschlin of the Netherlands peered up at the skies, and along with some others around the world, he caught a quick glimpse of a bright flash on a corner of the reddish-tinted moon. Details: While Fröschlin caught some particularly stellar imagery of the collision, many astronomers and sky gazers caught sight of the impact via livestreams of the eclipse from various observatories around the world. Some, as Drake and others wrote, debated the significance of the flash on Reddit and Twitter. 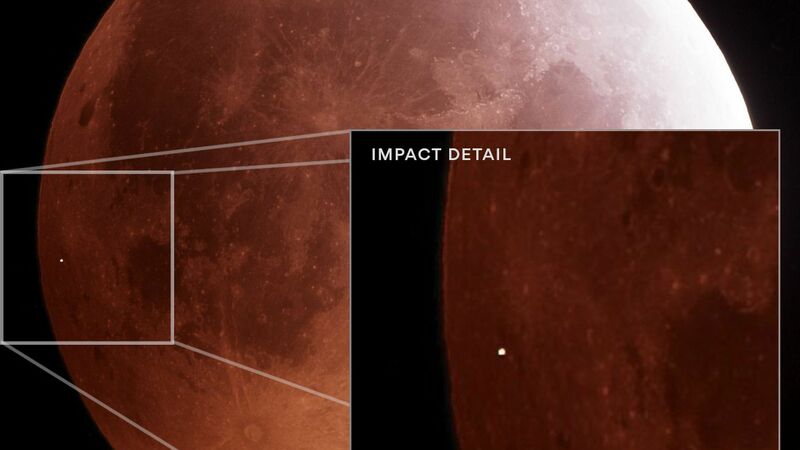 Fortunately, one of the observatories involved in the Moon Impact Detection and Analysis System (MIDAS) observed the impact flash, according to a Twitter posting by Jose Maria Madiedo, an astronomer at the University of Huelva in Spain. That seemed to settle the debate. “The impact flash has been recorded by telescopes operating in the framework of MIDAS survey from Europe,” he announced via Twitter. Madiedo included a link to a video of the event captured by the observatory. The next time you look up and think you spot something unusual, you might just be right. Just ask Fröschlin.